Petalburg City is the first large city you cross on your journey. It's also the first one to have a gym, although you are not able to battle there before you have the first four gym badges. Here you meet your second rival, Wally. Upon arriving in Petalburg City you should visit the Poké Mart in order to replenish any used Poké Balls and stock up on Potions. Also a quick stop in the Pokémon Center to heal your Pokémon would not be a bad idea. Once in Petalburg City, you can walk into the Gym and talk to your dad. He'll tell you a little about battling Gym Leaders, and that he won't battle you yet because you're too weak. You will be able to battle him when you have four badges. At this point, a boy named Wally will walk in, saying that he wants a Pokémon, and Norman will lend him a Zigzagoon. You will then see a demo on how to catch a wild Pokémon by watching Wally catch a Ralts. 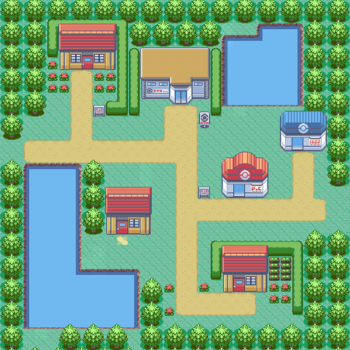 After Wally returns the Zigzagoon and leaves with his new Ralts, Norman will then tell you that you should head for Rustboro City to the north-west and battle the Leader there. You'll have to head west of Petalburg City and onto Route 104. If you're playing Emerald, you will encounter Scott for the first time as you are exiting Petalburg City. He recognizes you as a Pokémon Trainer, but doesn't feel that you are worthy yet for what he was going to ask. This page was last edited on 13 October 2014, at 22:47. This page has been accessed 219,095 times.